Hi there! Welcome to my Link Parties List! For years I have been linking to every post within that post. I’m honored and thankful that all of these AWESOME Bloggers allow me to link to their link parties and feature me and all of that wonderful stuff…BUT it’s getting messy my sweet friends. At the bottom of almost all of my posts are a gazillion links to parties..honestly I don’t mind that much BUT I’m leaking Google juice everywhere…I think and I just have to stop. So for the AWESOME Bloggers that let me link up…this list is for you! Also for you Bloggers ~ I offer a Link Party service! So if you don’t like this tedious but fruitful job, you can hire me! For my AWESOME AMAZING Readers…enjoy some new blogs, there are some pretty amazing blogs out there! Best of the Blogasphere ~ Add your BEST! Made by You Monday – Anything made by YOU! Make a Difference Monday – Encouraging women to live life on purpose. Mommy Moments ~ Anything Momma! Monday Musings ~ encouragement about being a child of God, being a wife, mothering, homemaking, homeschooling, recipes, etc. Monday Funday ~ Link up your latest and greatest projects; no Etsy shops or items you are selling. Homemaker Monday ~ tips for managing your household and being the best homemaker you can be. Living Proverbs 31 ~ Feel free to share your posts on Biblical Homemaking, and anything that pertains to Proverbs 31. Make it Pretty Monday ~ Recipes, DIY, anything pretty! Lou Lou Girls ~ Furniture makeovers, DIY projects, home decor, crafts, recipes, thrifty finds and archive loves. Busy Monday ~ Link only home related and family friendly posts that YOU created yourself. Please no link parties, sales pages, giveaways or posts you’ve linked before. 2 Cup Tuesday ~ Cooking, Recipes, Baking ~ Yummies! Simple Supper Tuesday ~ QUICK, EASY recipes, perfect for those busy weeknights. Turn it Up Tuesday ~ favorite posts (old or new) and meet some awesome bloggers in return! Link up your funny stories, DIY posts, recipes, mommy moments — anything at all. Moms Teaching Moms ~ Share your posts (as many as you’d like) that will be a help or blessing to other women. Hip Homeschool Mom ~ kid activities, homeschool related, or homemaking/recipe posts. Dream Create Inspire ~ diy, crafts, printables, tutorials, recipes, etc. Totally Terrific Tuesdays ~ Anything! Inspire Me Wednesday ~ crafts/DIY projects, your recipes/foodie posts, and the beautiful, interesting places you’ve traveled or visited. Coffee and Conversation ~ encouraging, informing, and inspiring women. Think: marriage, parenting, recipes, DIY, saving money, faith-building, etc. Wholehearted Wednesdays – wholeheartedly family friendly, wholesome, and spiritually uplifting and honoring to the Lord Jesus Christ. Ladies Collective ~ A linkup where you can share your favorite posts and meet new blogging friends. WFMW ~ tips, tricks, ideas and inspiration! A Little Birdie Told Me ~ recipe, craft, home decor project, home school post, activity/craft for kids, or any other post you’re proud of! Think and Make Thursday ~ Latest and greatest DIY projects, home improvement projects, crafts, recipes, kids stuff and home-related tips. This is How We Roll – crafts, home decor, home ideas, recipes, or related ideas to inspire all of us. Freedom Fridays ~ Start time Thursday around 8:00 pm This is an anything goes, no rules party! Link up your recipes, projects, crafts, printables … and yes, you can even link up your giveaways! Thriving Thursday – About thriving–in marriage, faith, parenting, homemaking, relationships, in the kitchen, in frugality. Soul Survival ~ character, family, parenting, marriage, homeschooling, devotions, and more – any God-honoring post. Crafty and Delicious Party ~ Crafty and Delicious! Family Fun Friday! – Lots of fun and fellowship on this link party! Family friendly posts and other link ups! Foodie Friday ~ favorite recipes and projects from your own blog. Roundups are fine as long as they include links to the recipes or DIY projects. Please DO NOT link a post without a recipe, project, craft, or tutorial. Blessing Counters ~ Where have you seen God’s grace at work this week? Homestead Blog Hop ~ homesteading, prepping, homemaking, or frugal living in nature. Weekend Bloggy Reading ~ Best post of the week. Pretty Pintastic Party ~ This is a super relaxed party! You show up with your fabulous posts and we pin every single one! We only ask one thing from you! Friday Favorites ~ Link up your favorite things from the week. Link up as many as you would like. Just no shops or stores please. The SITS Girls DIY Craft and Recipe Link up! Grace and Truth Link up ~ Leave 1-2 of your most recent Christian Living posts. Please do not link DIY, Crafts, Recipes, etc. Fridays Unfolded ~ Link up as many posts as you like – recipes, decorating, faith, kids, homeschooling, humor, giveaways…whatever unfolded for you lately. Flaunt it Friday ~ Decor, crafts, recipes, thrifty finds, helpful hints, whatever you’re proud of! Kitchen Fun and Crafty Friday ~ Crafts, Goodies, any DIY Projects, Printables, Recipes, etc… You get the point! Foodie Friday and Everything Else ~ Everything! This is amazing. Thank you Shari! I am SO glad that I saw this post of yours! I was just planning on trying to find more linky parties to join! I would LOVE to grow my blog readership! This helps so much! Thank you! Thanks for sharing your list. 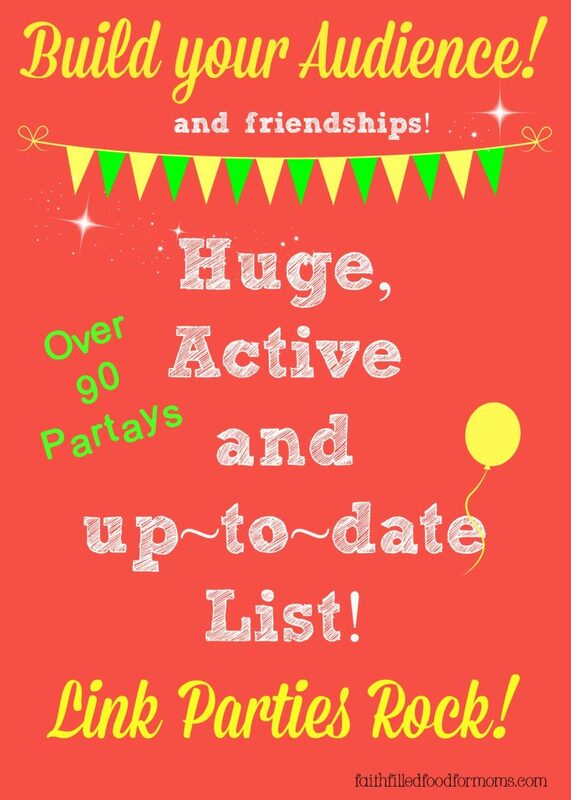 I have a party page with over 200+ link parties and I’ll have to see if there are any new ones that I can add & visit. Thank you so much for this list! I am a fairly new blogger and have been trying to find some great link parties. This is such an organized list. I love it!! !